A fashion march to address the new social climate we are facing today, inspired by animals, nature, and activism. The fashion collection is as strong as Pelush's philosophy, identity, and mission. We don't need to use animal skins for fashion anymore; fur, leather, wool, silk, exotic skins, and feathers are completely unnecessary and unjustifiable today. Glamorous, luxurious, romantic, and strong -- the first looks are bright and colorful with sparkling jewelry coats, hand-made embroidery flowers, multicolored sequins and beads on tapestry fabric. Bright teal shaggy coat with floral patches, and hand-made mixed faux fur flower dresses are reminiscent of Botticelli's garden paintings. Black faux broadtail tops, coats and pants with bold bright flower sparkling patch appliqués continue the look throughout the whole collection. Ethereal and romantic tulle dresses with three-dimensional flowers, mixed with faux furs, give the feathering effect without the cruelty. A black and white, long faux chinchilla, and faux fox scarf evokes veganism as our moral imperative, and the ultimate social justice for human animals, and non-human animals alike. Activism is present everywhere, on t-shirts, dresses, tops, and pants reminding the spectator how much animals are used for fashion, and questioning this urgent issue. Animal Rights activists@Ethically_Elizabeth (42.7K followers), and ten year old @AngelinaForTheAnimals (20.9K followers) led the march/fashion show, followed by other activist models, including representatives from several animal rights groups, such as PETA, NYCLASS, Anonymous for the Voiceless, Animal Ashram, and role models from "Role Models Management". 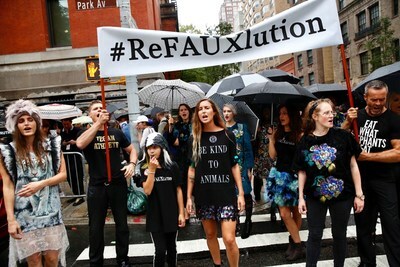 The Fur Revolution -- #ReFAUXlution -- is an anti-fur movement, a fashion statement standing behind the Pelush philosophy, offering the best possible alternative to real fur. It's the antidote to the fur industry.